Last major update issued on September 22, 2004 at 03:00 UTC. Minor update posted 06:07 UTC. The geomagnetic field was quiet to unsettled on September 21. Solar wind speed ranged between 373 and 450 km/sec under the influence of a weak and slow coronal hole flow from recurrent coronal hole CH114. 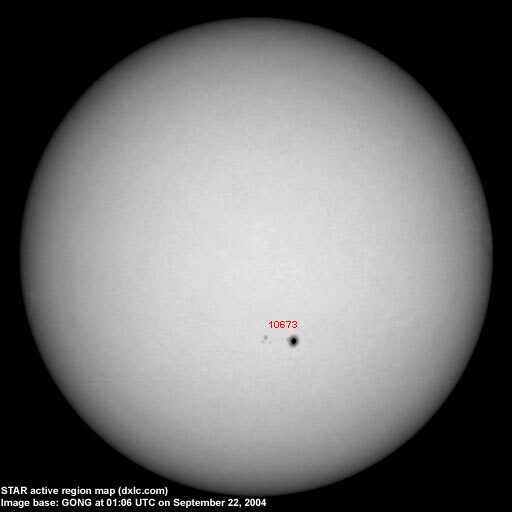 The expected CME from the M1 event on September 19 has not arrived. Solar flux measured at 20h UTC on 2.8 GHz was 94.9. The planetary A index was 9 (STAR Ap - based on the mean of three hour interval ap indices: 10.6). Three hour interval K indices: 23322222 (planetary), 24322212 (Boulder). At midnight there was 1 spotted region on the visible disk. The solar flare activity level was low. A total of 1 C class event was recorded during the day. Region 10672 rotated out of view at the northwest limb. 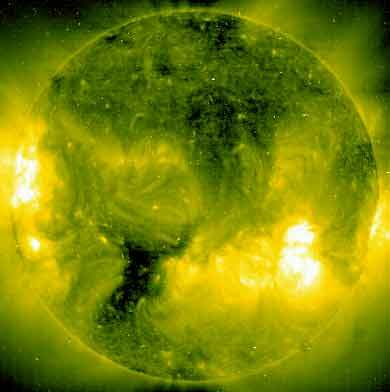 Flare: impulsive C7.5 at 08:36 UTC. Region 10673 decayed slowly and quietly. Comment added at 06:07 UTC on September 22: A solar wind shock was observed at ACE at about 06h UTC with an increase in solar wind speed from 440 to 540 km/sec. Initially the interplanetary magnetic field has been northwards and it is too early to tell if this disturbance will have significant geomagnetic effects. September 19-21: No LASCO observations. A CME was likely associated with the M1.9 event in region 10672 on September 19. No obvious coronal holes are currently approaching geoeffective positions. Recurrent coronal hole CH114 was in a geoeffective position on September 18-19. The geomagnetic field is expected to be quiet to unsettled on September 22-25. There is still a slight chance of a glancing blow from a CME on September 22. In that case geomagnetic activity could increase to the unsettled to active level. Long distance low and medium frequency (below 2 MHz) propagation along east-west paths over high and upper middle latitudes is fair and has improved significantly over the last day. Propagation along long distance north-south paths is poor. Trans Atlantic propagation conditions are monitored every night on 1470 kHz. Dominant stations tonight: Radio Vibración (Venezuela) and WLAM Lewiston ME. On other frequencies some stations from Venezuela and Colombia were observed, however, most stations were from the eastern parts of Canada and USA. 1650 kHz had Radio Disney with a fair signal.